A cute owl is ready to welcome your new little one to the world. 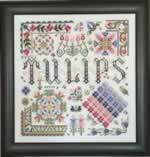 Full kit from Bucilla includes 14ct white Aida, floss, needle, pattern and instructions. The finished size is 10" x 13".